Acne is a common skin condition that affects most people at some point in their lives, it is so common it is almost considered a normal part of growing up. Generally, boys are affected more than girls and the severity can range from mild to severe. Acne is not a serious health condition but it can cause scarring and emotional distress. Acne normally affects the face (almost everyone), back (more than half the people with acne) and the chest (affects about 1 in 7 people). There are different spots that are associated with acne these are blackheads, whiteheads, cysts and papules. Acne takes the appearance of bumps on the skin these can be small and black (blackheads), small with white heads (whiteheads), red bumps that are tender to the touch(papules) or large hard lumps they can feel sore to the touch and can contain pus (cysts). Acne is normally associated with puberty around the ages of 12 and 17 (but can happen at any age) acne at this age is linked mainly to the increase in the male hormone testosterone. Though testosterone is a male hormone and men carry far more of it, women do also produce testosterone in the ovaries. Adult acne in women is normally caused by hormonal changes during menstruation, pregnancy or PCOS (polycystic ovary syndrome). The grease producing glands in people with acne are very sensitive to hormones and produce larger amounts of oil. This oil known as sebum is what keeps the skin supple and from drying out. This extra oil being produced causes the opening to the hair follicles to block with excess oil and dead skin cells, then once trapped inside acne bacterium can multiply and result in spots, pimples, blackheads and other similar skin blemishes. If you have acne it doesn’t mean you have high levels of testosterone your body is just more sensitive to the hormone. Acne can run in families so if your parents suffered you are also more likely to develop it. What can make my Acne worse? Sweating heavily or humid conditions as the extra sweat can block pores. Very thick or greasy make-up, use make up that is oil-free or even ranges for acne-prone skin. Medications, such as ones used to treat epilepsy, depression or bipolar. Regularly wearing items that apply constant pressure to the skin – e.g. a back-pack or headband. Keep hair clean and grease free, oily hair can encourage spots especially around the hairline and forehead. Try to keep hairsprays away from the face also. Picking, squeezing can make spots worse and cause scarring. Acne is not contagious and it cannot be passed on to other people. Your doctor or pharmacist will be able to diagnose acne from looking at your skin. Your GP will examine your face and can grade the acne from mild to severe. In women if they have other symptoms such as excessive body hair or irregular periods then your GP might suggest you get a blood test for a hormone imbalance, the most common reason is due to PCOS (polycystic ovary syndrome). Treatment for acne will depend greatly on the severity. However, you must be patient – those spots will not disappear overnight and it normally takes about 6 weeks to get rid of most or all of the acne. You may also be advised to continue treatment to prevent acne returning. Do not wash your face more than normal, twice a day is sufficient and use lukewarm water. Do not scrub your face, excess washing and scrubbing can cause more inflammation and may even make the acne worse. The aim of treatment is to clear spots as much as possible and prevent scars from occurring. You should always try to treat the acne as left untreated acne can last 4-5 years before settling. Most cases of acne can be successfully treated with an over the counter treatment which contains benzoyl peroxide (an antiseptic). Benzoyl peroxide works by killing the bacteria causing the skin irritation and unblock blocked pores. Apply the cream daily; it is usually better to apply at night and wash your face in the morning. As benzoyl peroxide is a strong cream it can cause skin drying, you should also avoid the eye area. Be careful that you don’t get the gel on your clothes or towels as Benzoyl Peroxide can have a bleaching effect. If your acne is especially bad, doesn’t get better or is resistant to the antiseptic contained in the benzoyl peroxide cream then you should visit your doctor. Your doctor can then prescribe an appropriate treatment that may include an antibiotic lotion in conjunction with a treatment gel. Other treatment options include a course of antibiotics (amoxicillin, augmentin or cefalexin) tablets or for some women the combined contraceptive pill can help to regulate your hormones. What is the long term effect of Acne? Acne can cause scarring, avoid squeezing and picking your spots to limit this. If your acne has caused scaring then speak to your doctor. Treatments for scarring are not usually available on the NHS as it is classed as cosmetic surgery. However, your doctor might be able to suggest options to help and advice on the best solution. 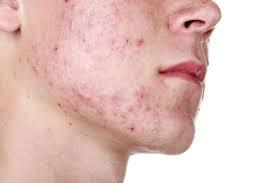 Acne can also cause depression and make the individual want to hide away. If you suspect you or your child might be suffering from depression, speak to your doctor for advice. Poor diet, dirty skin and poor hygiene do NOT cause spots and in fact washing your skin more than twice a day could make the spots much worse. Scrubbing your face will not help either. Squeezing blackheads, whiteheads, spots is NOT a way to get rid of them. Chances are it will make things worse, look worse and may lead to permanent scarring. There is no medical evidence to support that sunbathing, the use of sunbeds or sunlamps will help and is more likely to damage the skin. Drinking water will not cure acne. Toothpaste is NOT the answer – it can help as it contains antibacterial substances but it also contains substances that will irritate and damage your skin.